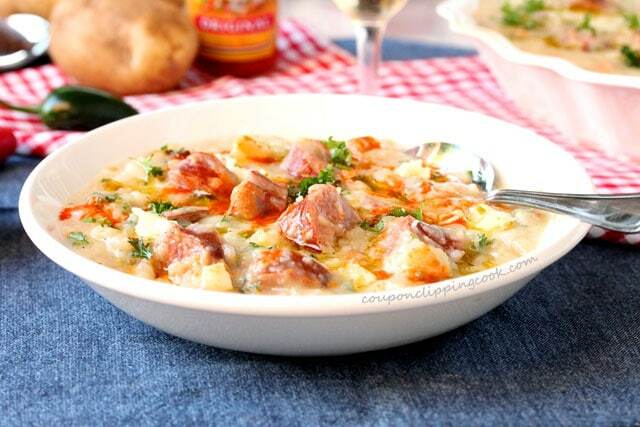 Doesn’t get much better than this thick and hearty potato soup made with smoked sausage and hot pepper jack cheese. 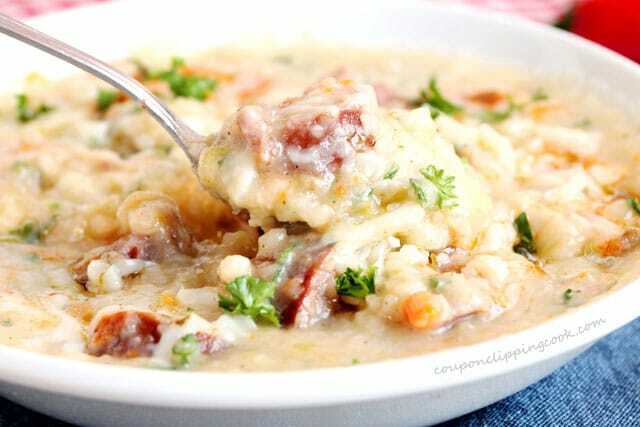 A delicious hearty bowl of soup is so comforting any time of the year and when the slow cooker does the cooking it’s even better. 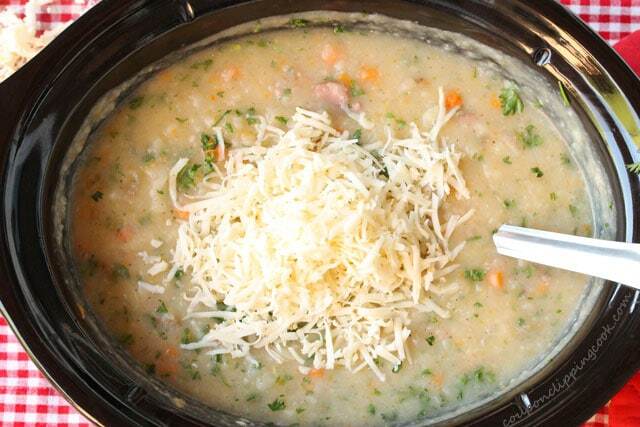 Whether it’s Winter, Spring, Summer, or Fall, it’s a good time for a scrumptious bowl of soup. 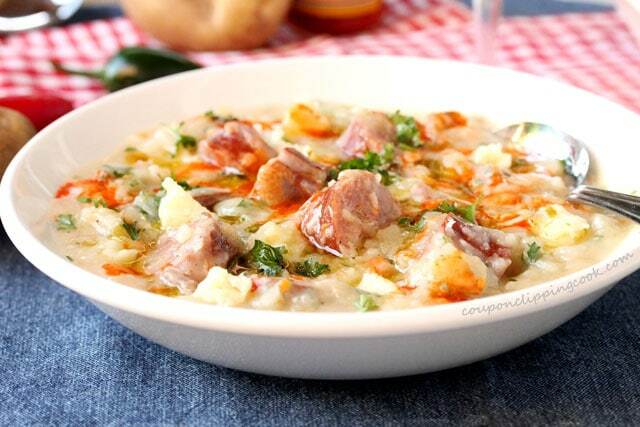 This soup has potatoes, vegetables and smoked sausage in it so it’s just like having a one-skillet meal for dinner only I guess it’s more like a one-bowl meal. 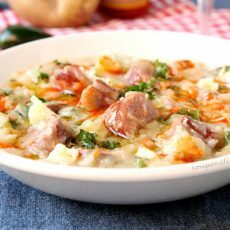 The smoked sausage adds such a wonderful smoky flavor in this soup and it’s topped off with a little spice from the hot pepper cheese that’s also added. 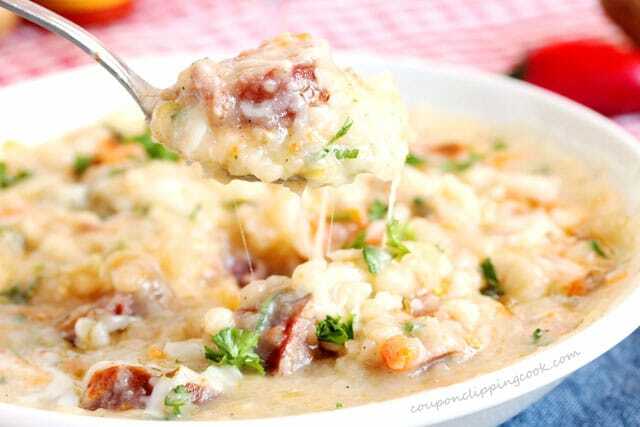 This soup is made with milk rather than cream so that it’s not too heavy but if preferred, half and half or cream can be used instead of milk. I like to serve it topped with drizzles of hot sauce not only for color but for an added pop of flavor. So, let’s check out the ingredients. 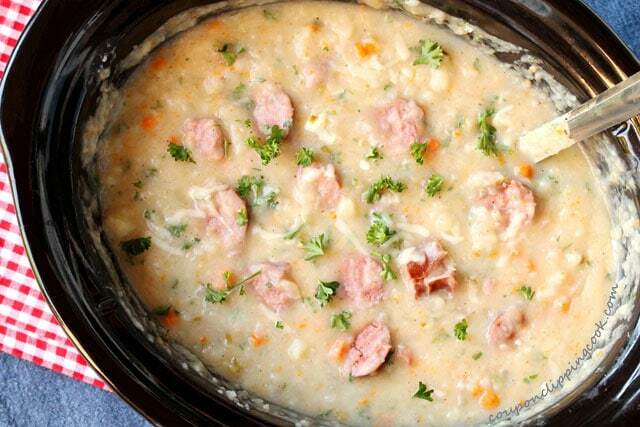 Russet potatoes, onion, carrots, celery, garlic, chicken broth, fully cooked smoked sausage, parsley, butter, flour, milk (or half and half if preferred), salt, pepper and pepper jack cheese. For serving – hot sauce and olive oil. 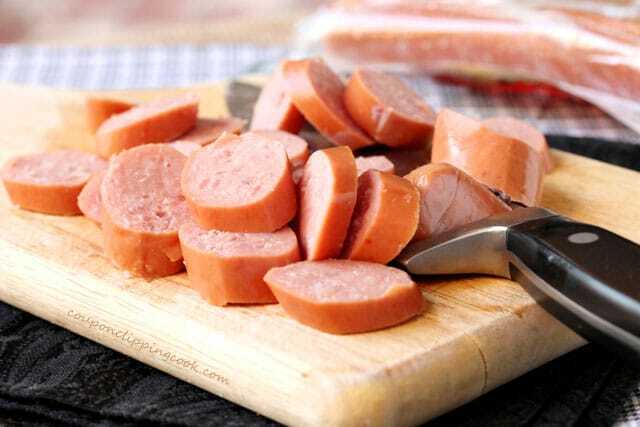 Slice (widthwise) half of the quantity of sausage. 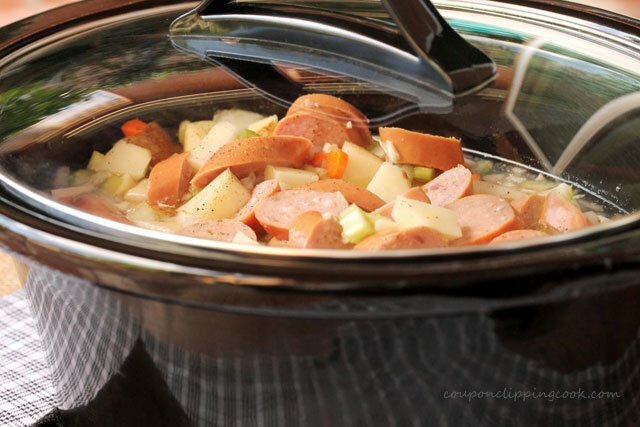 Keep the other half of the sausage in a whole link so that it’s easier to remove from the pot before mashing the cooked vegetables. 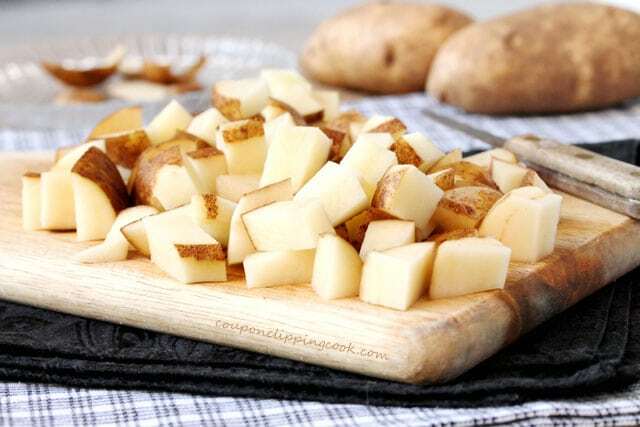 Remove any bad spots or bruises from the potatoes, and cut (leaving the skin on) into pieces that are about 1-1/2 inches square. Top with the sausage. Don’t stir in the sausage. 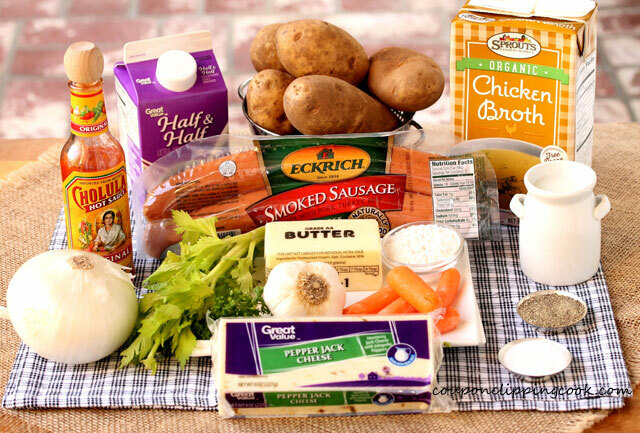 Keep the sausage on top so that it’s easier to remove before mashing the potatoes and veggies. Top with a couple pinches of pepper. 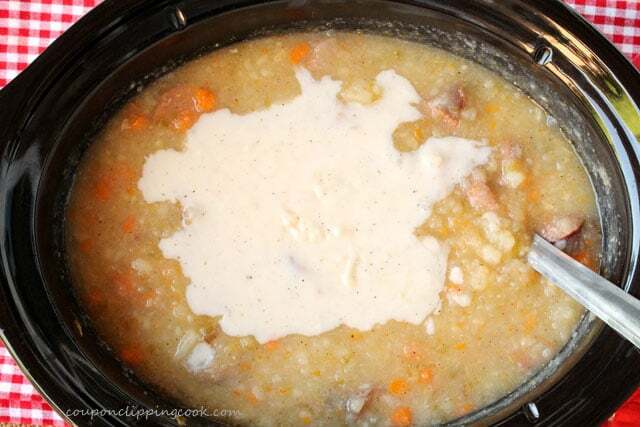 Cover with a lid, set the slow cooker on high, and cook for 4 hours. 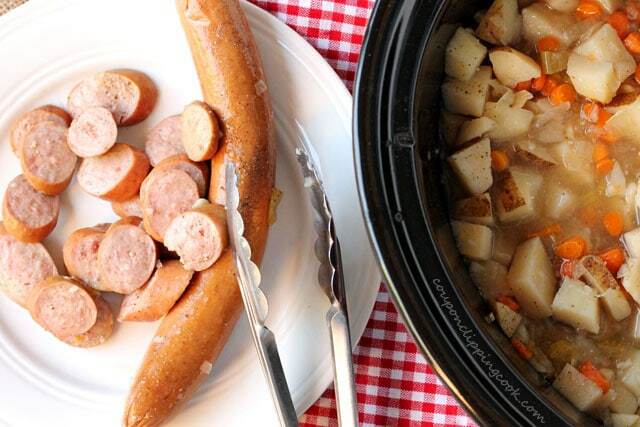 …transfer the sausage to a plate. Set the sausage aside for a moment. 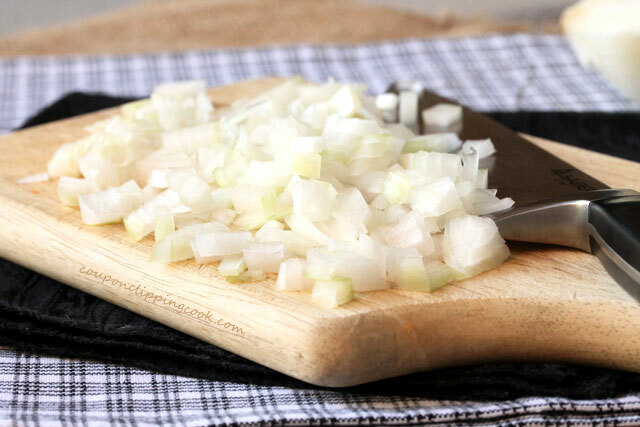 …until the consistency is thick and still has small pieces in it. …and add to the pot. Stir together. 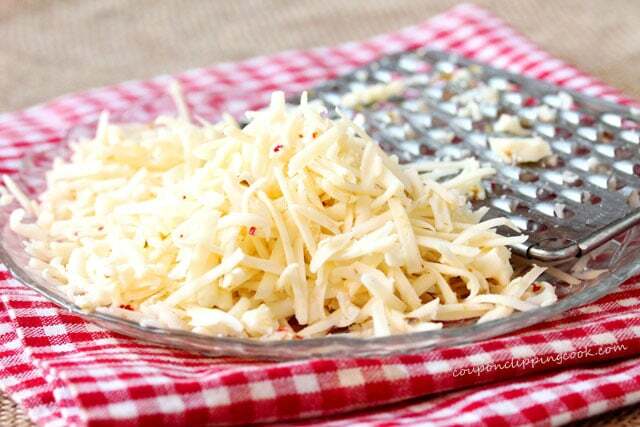 …shred the cheese. Set them aside. 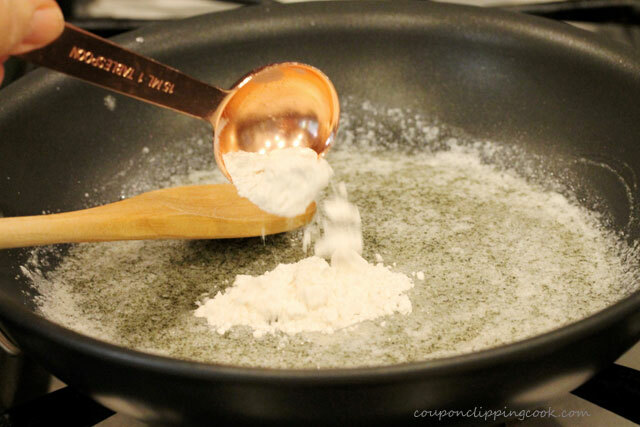 the flour is incorporated with the butter. 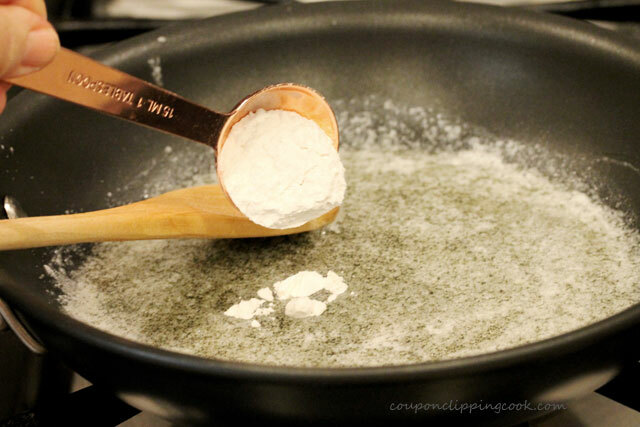 If the mixture starts to have large bubbles in it, turn the heat down slightly. 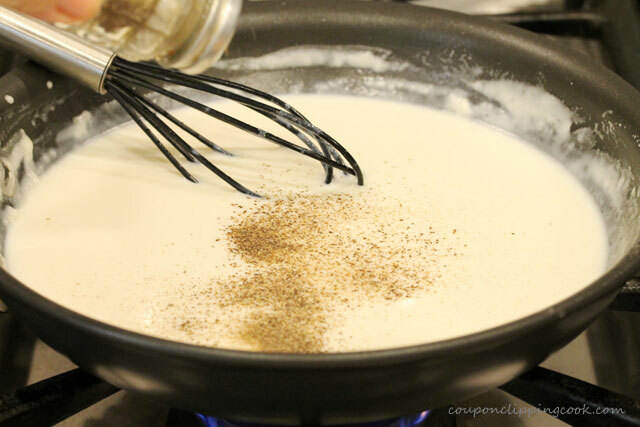 Stir in milk (or half and half if preferred). 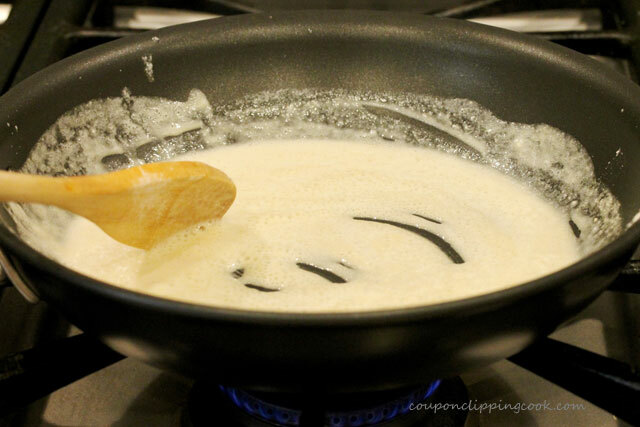 Continue to stir until creamy (about 2 minutes). 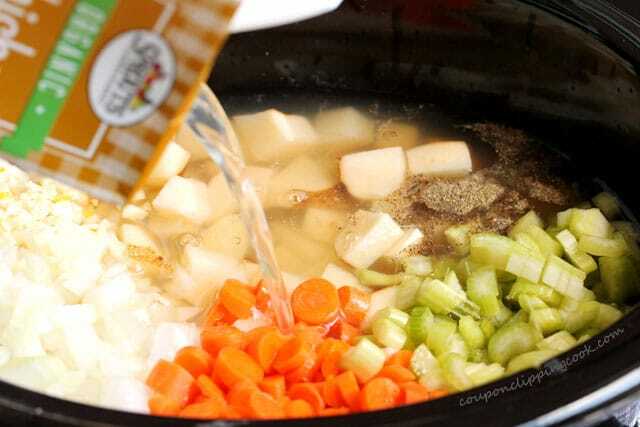 To the slow cooker pot, add the roux. 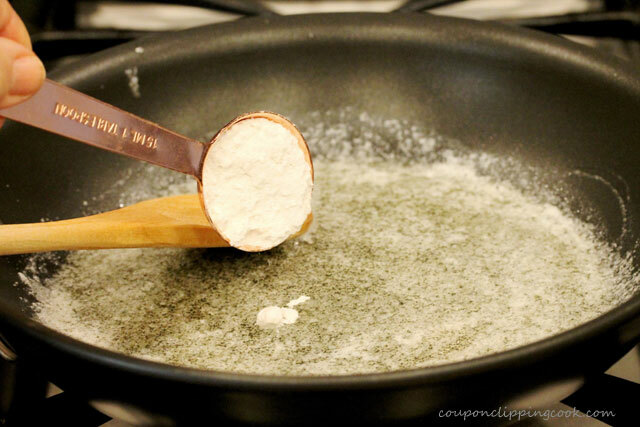 …stir. 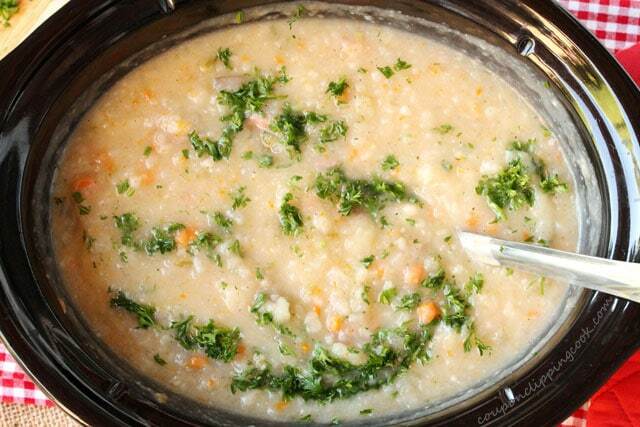 Give the soup a taste test to see if it needs more salt and, or pepper. 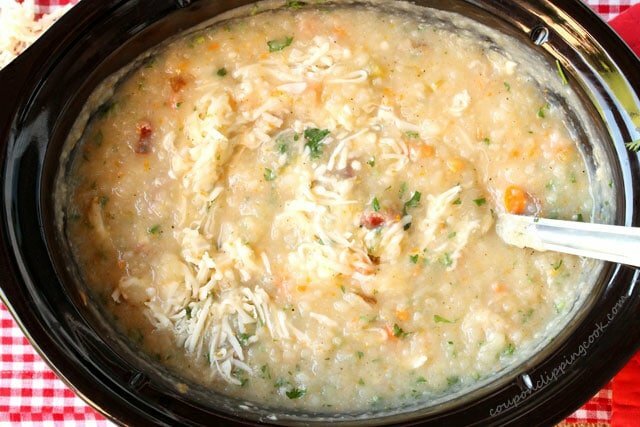 Serve warm right out of the slow cooker. Top with drizzles of hot sauce, olive oil, a bit of parsley, and small chunks of pepper jack cheese. 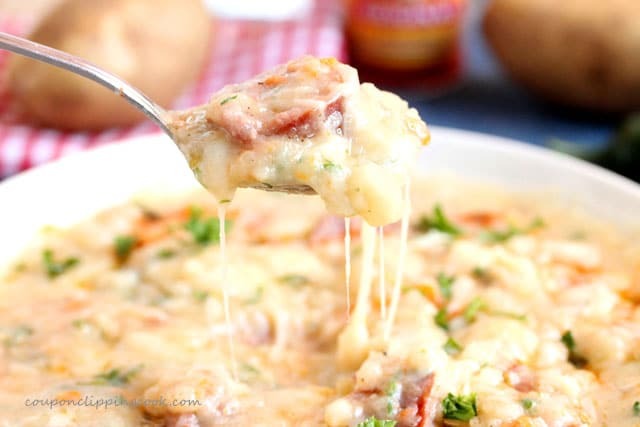 Doesn't get much better than this thick and hearty potato soup made with smoked sausage and hot pepper jack cheese. 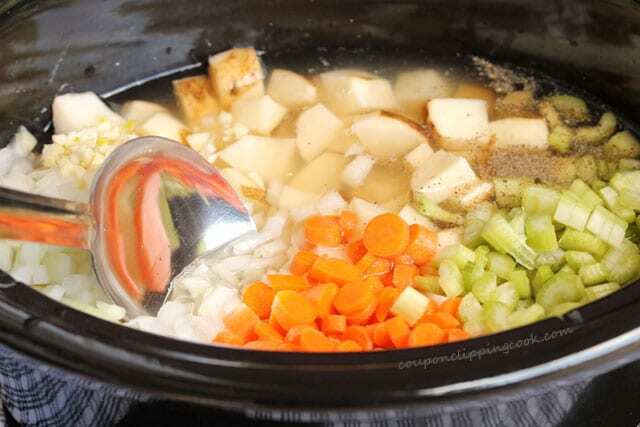 In the slow cooker pot, add the potatoes, onion, celery, carrots, garlic, salt, pepper and chicken broth. Stir together. 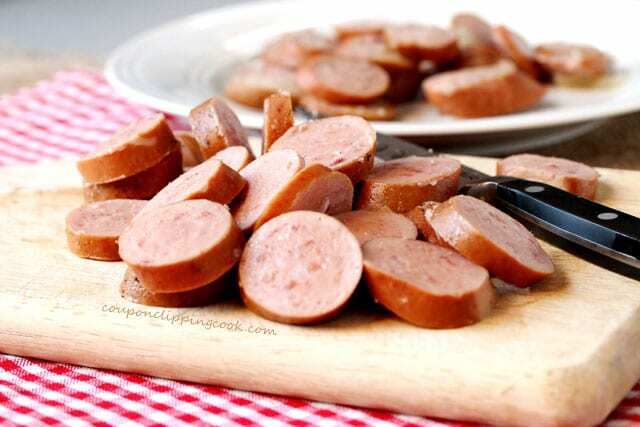 Slice (widthwise) half of the quantity of sausage. 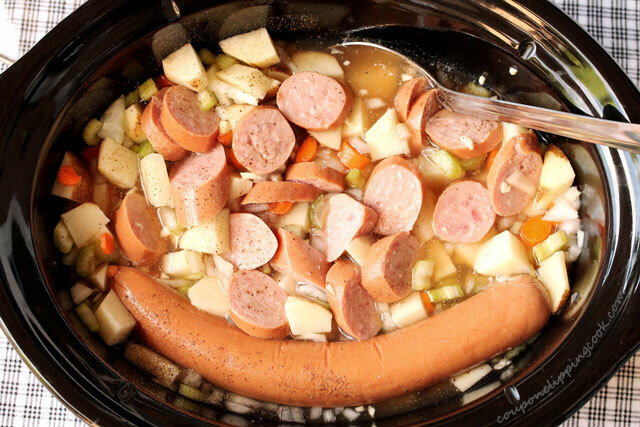 Keep the other half of the sausage in a whole link so that it's easier to remove from the pot before mashing the cooked vegetables. 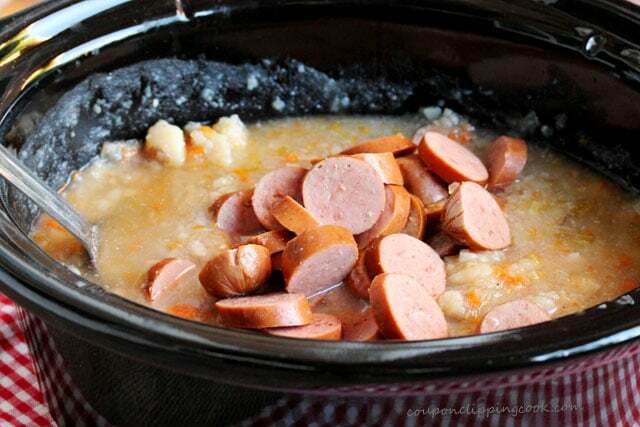 To the pot, add the halved link of sausage and top the ingredients that are in the pot with the sausage. Don't stir in the sausage. 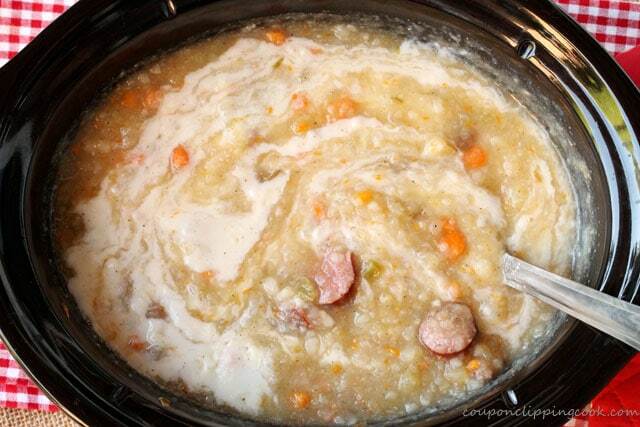 Keep the sausage on top so that it's easier to remove before mashing the veggies. Top with a couple pinches of pepper. 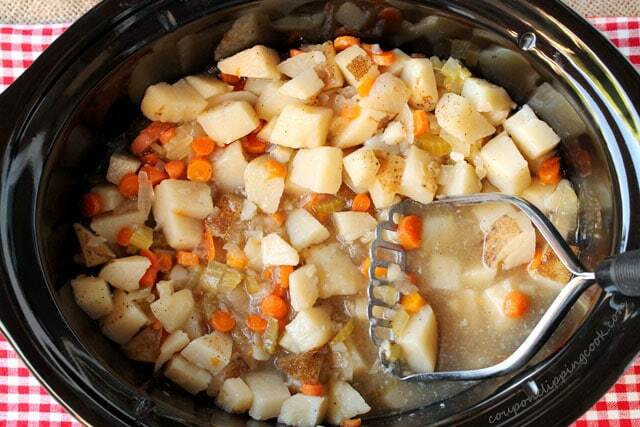 Cover with a lid, set the slow cooker on high, and cook for 4 hours. 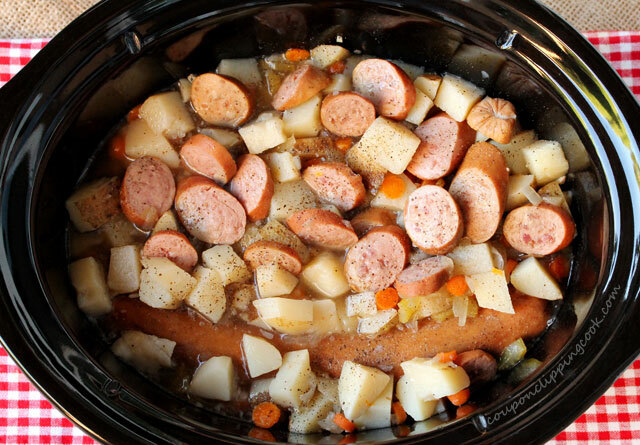 After it's done cooking, turn the slow cooker setting to warm or low and transfer the sausage to a plate. Set aside for a moment. 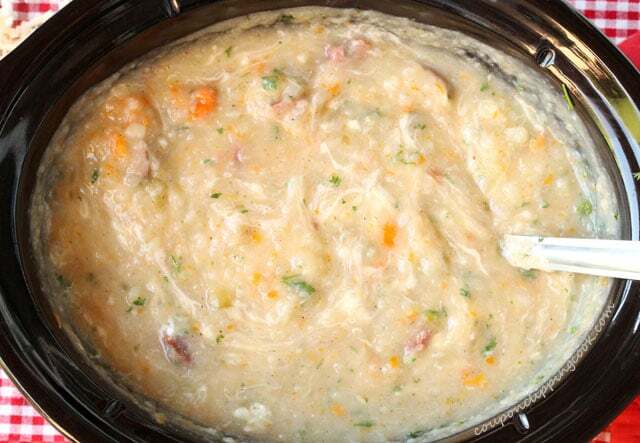 Using a potato masher, mash the potatoes and vegetables until the consistency is thick and still has small pieces in it. Slice the remaining link of sausage widthwise and add to the pot. Stir together. 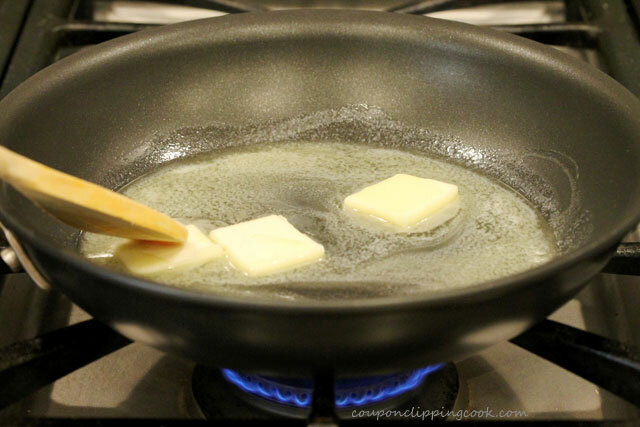 Heat a medium size skillet on medium heat and add butter. 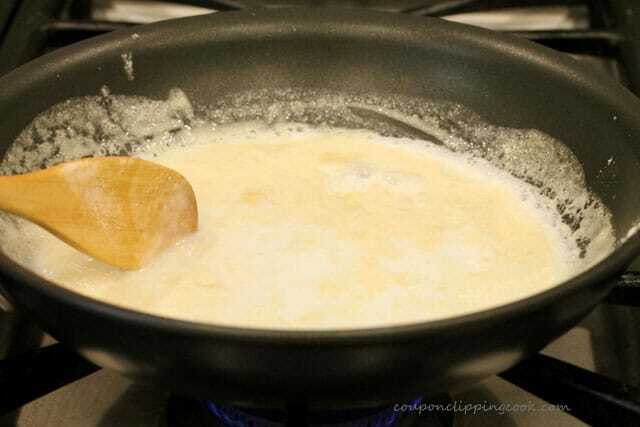 Stir the butter until melted and then add flour. 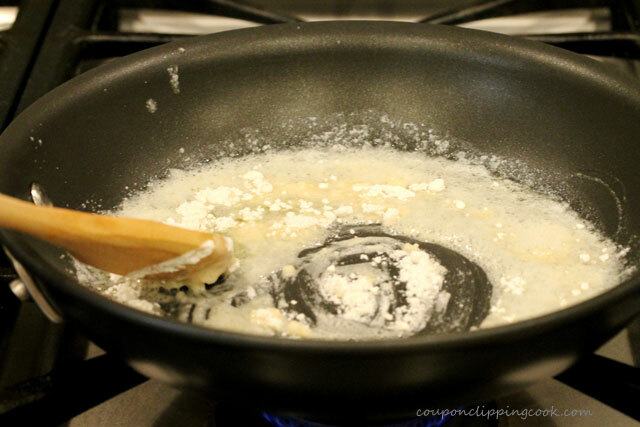 Stir until the flour is incorporated with the butter. 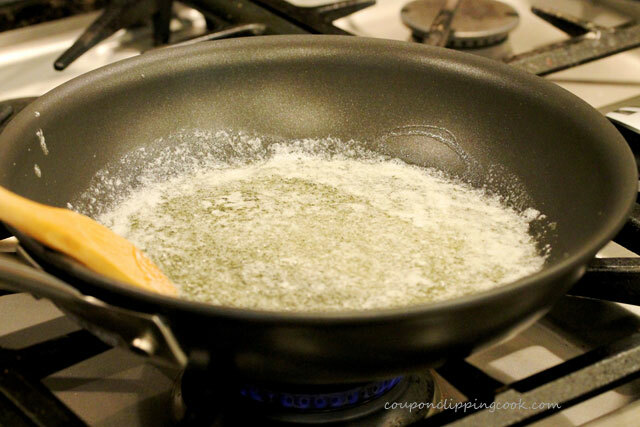 If the mixture starts to have large bubbles in it, turn the heat down slightly. 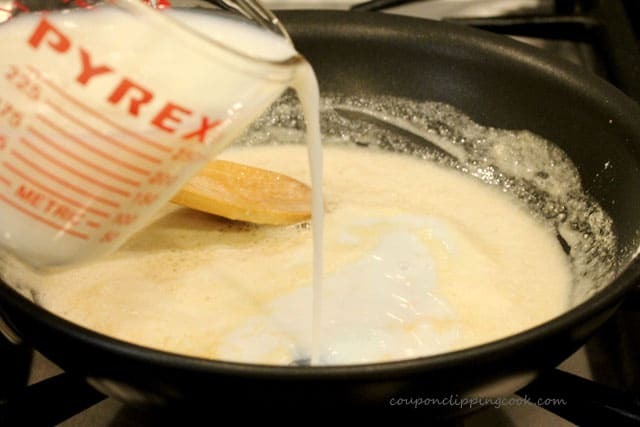 Stir in milk (or half and half if preferred). 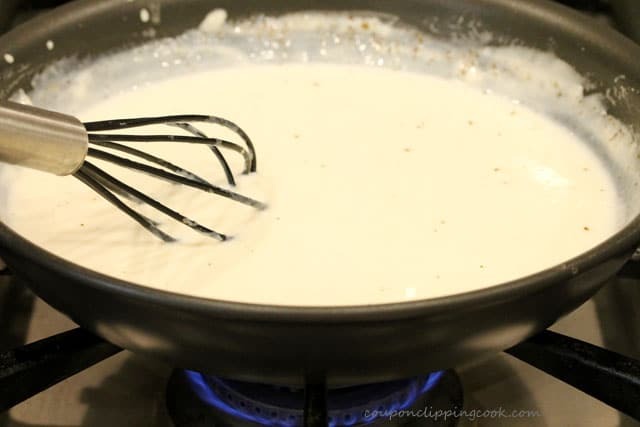 Continue to stir until creamy (about 2 minutes). Add pepper and stir. 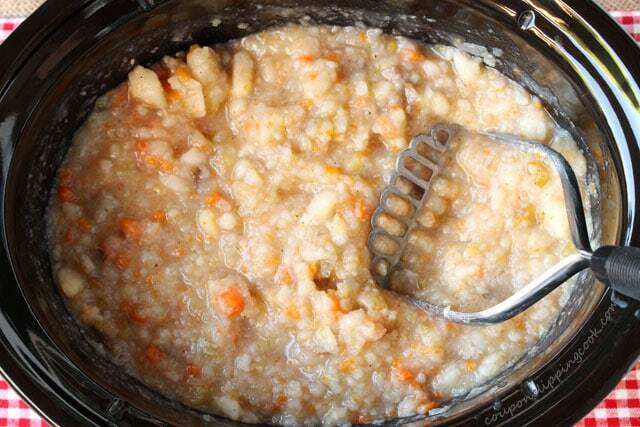 To the slow cooker pot, add the roux and stir. 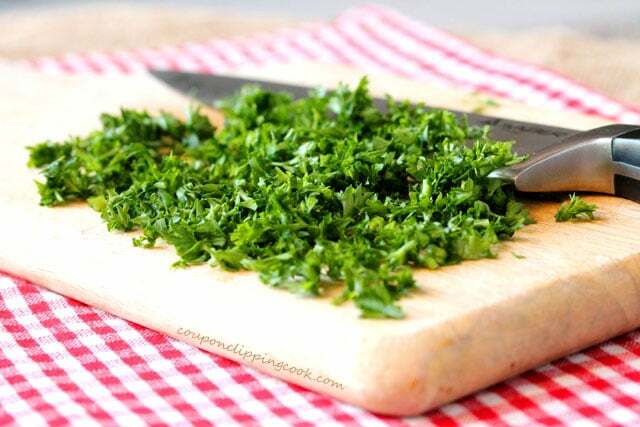 Add parsley and stir. 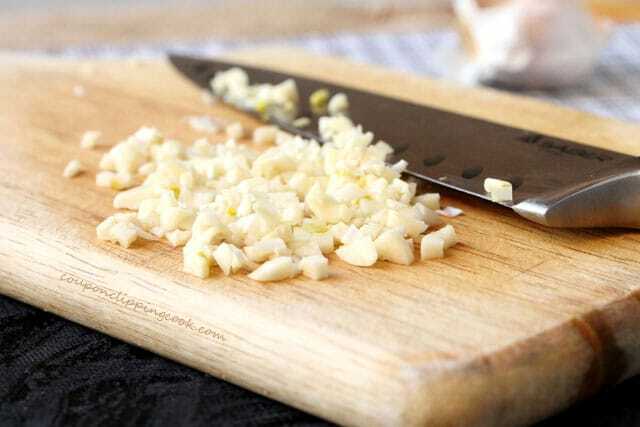 Add the shredded cheese and stir. 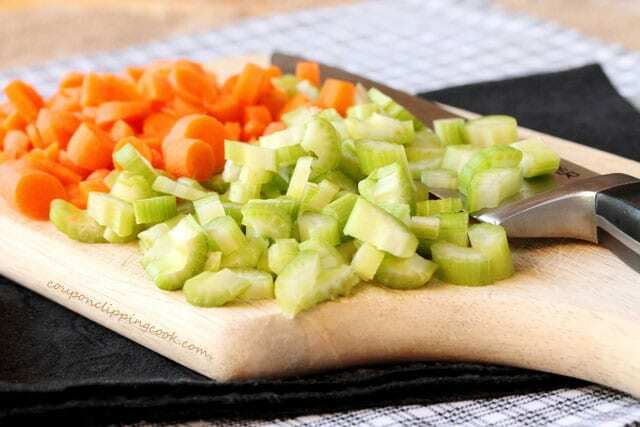 Give the soup a taste test and add more salt and, or pepper if needed. 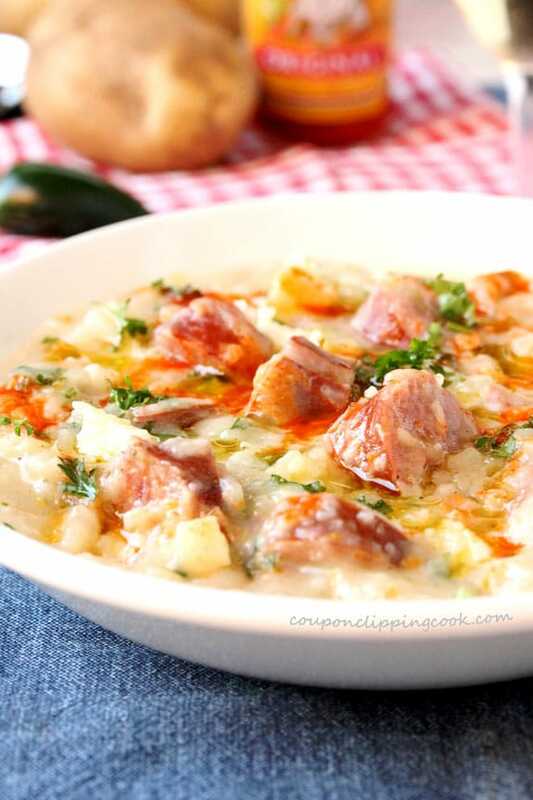 Serve warm right out of the slow cooker and garnish with drizzles of hot sauce, olive oil. 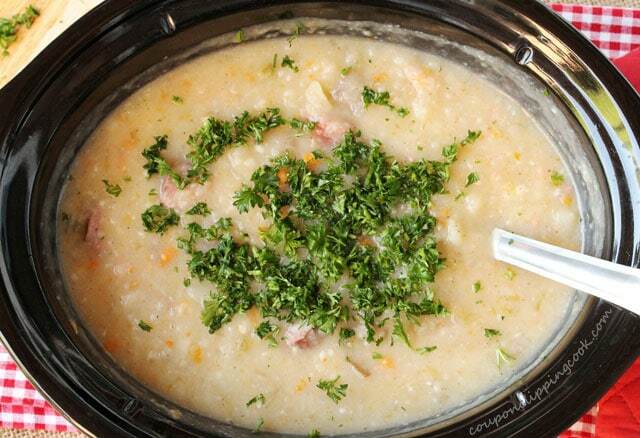 Top with parsley and small chunks of pepper jack cheese. 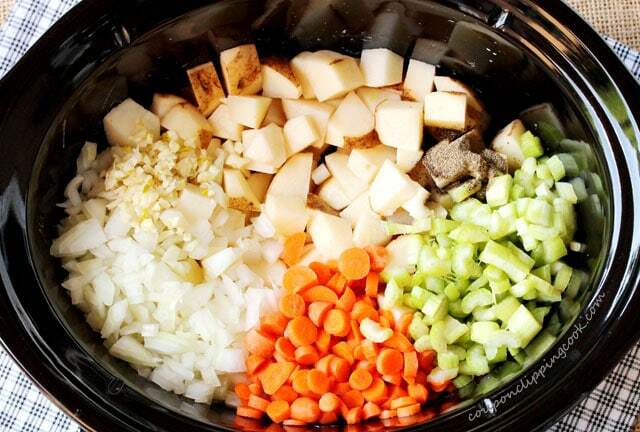 I love slow cooker recipes, so please keep them coming! At first I didn’t like them that much because they took a long time to finish, but I’ve learned to enjoy the waiting!